AngularJS - one of the most popular and widely used structured frameworks. In Mobile App Development, it is mainly used to build highly dynamic single page applications. Introduced in the years 2012 - AngularJS framework owes google's huge support of a multinational corporate backing up it. Mostly known as the client-side framework, the Angular framework also supports different platforms as the majority of its features allow flexibility to decouple any app logic straight from the Document Object Model i.e. DOM manipulation. Further, the highly efficient features of angularjs framework for mobile apps makes it an ideal option for a majority of businesses, especially for the app development business. 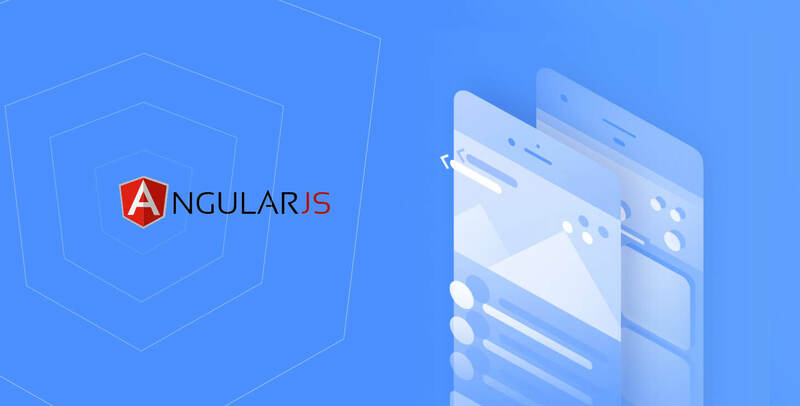 Today, with more advancement in the digital realm, the AngularJS developers are highly particular about the elements of the specified AngularJS framework. And its usage regarding how to develop phenomenal mobile and web applications. Considering the specified requirement, we have curated a list featuring some of the best angular JS frameworks that allow creating advanced applications for different purposes. Generally, the framework is the combination of the native AngularJS directives with CSS and bootstrap HTML components, developed on a top-notch front-end frameworks known as Bootstrap. It consists of a wide range of in-built elements, as it is a dominant bootstrap powered framework. With the repository of components available, including Bootstrap CSS, angular-touch, AngularJS, angular-animate etc, the developers can use these repository components to develop customized templates as per their specifications. Numerous directives like the drop down, time picker, alert, carousel, etc are offered by the angular framework. This framework has a very small footprint, (approx 20kb when gzipped) without the third party dependencies like bootstrap and jQuery. According to the survey conducted the previous year, the Angular UI Bootstrap is also one of the most known bootstrap-based frameworks. ➤ The conversion of this bootstrap-based framework is essentially absolute. ➤ Large community to provide on-the-spot support. ➤ There is no obligatory provision for jQuery. ➤ Customization process is difficult to some extent. Must Read: Why AngularJs Is Exalted by Fortune 50 for Web Development? The Mobile Angular UI is a UI framework - generally, it can be referred to as an extension to the bootstrap angularJS framework. Created with the main concern to develop advanced mobile application development. The framework is also preferred by app developers to design the HTML5 powered mobile apps. The Bootstrap and AngularJS-optimized framework provide an extensive support for libraries including overthrow.js and fastclick.js. Most of its syntax is from bootstrap 3 but with few more added mobile-specific components like sidebars, overlays, switches, scrollers etc. Further, with the specific components for the mobile application, the developers can also easily modify the web apps into the mobile apps with highly responsive User Interface (UI) and that's quite beneficial in inducing huge audience base on your app. ➤ The mobile angular UI framework is lightweight and very active. ➤ It consists of mobile bootstrap 3 syntaxes. ➤ The presence of mobile-only components makes it a great choice for mobile app development. ➤ Conversion from the desktop to mobile is relatively simple with this framework. ➤ Its community still needs time to prove its existent. ➤ It requires more changes in comparison with OnsenUI and ionic framework. ➤ The documentation of this framework is average or lower compared with other framework documentation. One of the amazing AngularJS framework - Ionic - is mainly used to build the mobile applications, also it allows developers to create web apps. Iconic is an extraordinary framework optimized along with the AngularJS directives so that it can support the development of HTML-powered apps, offering intense CSS3 user interfaces. Further, to make the process of developing mobile apps very faster and easier, the 'ionic creator' can be used by the developer to achieve the desired result. The ionic creator lets the developer build an app by the action of dragging and dropping components according to the requirements of the project. Built with SAAS, the ionic framework offers a free open source SDK i.e. Software Development Kit having interactive UI components essentially to develop hybrid mobile apps for touch sensitive smart devices. Also, the angular framework comes as an ideal choice, when speed and performance aspects are the priority in the app development process. ➤ Excellent support through the panel. ➤ A number of tools are offered by ionic including Ionic.IO and iconic market. ➤ Optimized for Android and iOS touch devices. ➤ Offer flexibility to use third party resources like themes and plugins. ➤ Ionic framework provide access to good command-line interface (CLI) tool. ➤ It lacks behind in features than other frameworks like OnsenUI. ➤ It is not supported by the latest Angular features. ➤ On the slower mobile devices, animations portion do not work. ➤ The default user interface (UI) of the ionic framework is relatively muffled. Regarded as one of the first responsive front-end frameworks. Well, Lumx, like Angular Material is based on the Google Material Design specifications. It helps the app developer in building engaging and unique looking applications with material designs. Building web applications are easy and fast with lumx because everything is developed on the Google guidelines. However, it also depends on AngularJS for expediting the app development based on the MVC design pattern. This front-end framework is built on Bourbon, Neat, and SASS, fusing the attractive features and great functionality. It is mainly used for developing customized app designs with vibrant features. ➤ Offers ideal option to create feature-rich customizable app designs. ➤ Follows important standards and specifications of Google Material Design documents. ➤ Automatic optimization to improve functionality. ➤ It cannot be checked to be in a production ready state. Specially made for the AngularJS Developers and programmers - the Angular Material is referred to as a User Interface (UI) component library. The framework is highly recognized to offers more than 30 different UI services and components. And, this further guide in building compatible and extremely functional web applications. Inspired by the Google Material Design documents, this framework is aimed at developing engaging web pages adopting the renovated web designing principles. Some of these latest principles include artistic degradation, browser portability, and device independence. Angular Material also presents an all-inclusive set of open and reusable UI directives for the app developers. In general these directives are based on the material design system that allows faster development and responsive websites with features like hover effect, built-in ink, etc. ➤ Follows the updated Google Material Design documents and principles. ➤ The websites built are engaging, responsive and agile. ➤ The community of Angular Material has matured especially when compared to other frameworks. ➤ Inadequate support for the Angular framework. Hire Angularjs Development Company highly specialized in delivering development based on your business type, for instance, specific framework fit in particular business type, hence depending on the same the section is executed by a leading and renowned company.